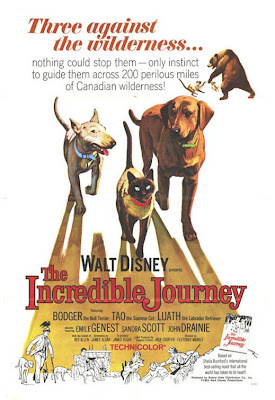 Since the end of the True-Life Adventure series, Walt Disney had made three films starring animals to tell a pre-written story in conjunction with Calgary Ltd, a Canadian film company. While these films weren't usually big hits at the box office, they were inexpensive to make and were almost guaranteed to make money. For his fourth of such films, he selected a very popular book called The Incredible Journey by Sheila Burnford. James Algar, who worked on the True-Life Adventure films as well as the previous Calgary Ltd. productions, adapted the screenplay. Canadian director Fletcher Markle was hired to direct his only Disney film. Rex Allen narrates his second Disney film after narrating Niki Wild Dog of the North. Émile Genest stars in his third and final Disney film, after previously appearing in Niki Wild Dog of the North and Big Red. While there aren't any other familiar Disney faces, Jan Rubes who plays Carl Nurmi returned to the studio many years later in D2: The Mighty Ducks in 1994. The film begins with flyovers of Canadian forests. The narrator then introduces John Longridge and the three pets he is looking after while their owners are away. When John goes off hunting, there is a communication error and his housekeeper thinks he has taken the pets with him. In reality, they assume they have been abandoned and set off on a 200 mile journey back to their real home. They get into an altercation with a bear, meet an eccentric mountain man and when they get seperated, Tao the Siamese cat gets into a fight with a lynx. After reuniting, Luath the retriever gets quilled in the face by a porcupine and is helped by a kind hunter and his wife. When John Longridge arrives home to discover the animals are missing, he notifies the family. While the parents don't believe the animals will return, the children don't lose hope. On the son's birthday, the pets return to their home, having completed their three week journey. The Incredible Journey premiered on October 30th, 1963 and was released to theaters on November 20th. Critics adored it, praising it as one of the best animal movies for children. It was not a huge box office hit, but because it didn't cost much to make it turned a profit. The studio rereleased it to theaters in 1969. It was first shown on the Wonderful World of Color in 1977 and was released on home video in 1984. I've never been a huge fan of Disney's narrated scripted animal films, but The Incredible Journey is certainly one of the better ones. While you would expect the human actors to lead the story and carry the emotional weight, the animal actors far outshine anybody with a speaking role. And many of the shots are amazing, including the fight between the cat and the lynx. I think the biggest mistake with the film is not showing the pet's owners until the end of the film. It's hard to care about people at the end of a film who have been absent the whole time. It's something they corrected in 1993 when the film was remade as Homeward Bound: The Incredible Journey. That film starts with the family and how much they love their pets and also returns to them several times to show how miserable they are without them. While some may prefer this 1963 version that doesn't feature talking animals, the remake adds an emotional element that is missing here. However, both are good films on their own terms. The Incredible Journey is currently available on DVD as a Disney Movie Club Exclusive. The film is presented in its original theatrical widescreen aspect ratio of 1.75:1, although the back of the box incorrectly lists it as being in fullscreen. No bonus features are included. The film is also available on iTunes in widescreen, where it can also be purchased in HD.